You are here: Home / News & Cases / Can You Recover For Lost Wages and Job Opportunities as a Result of An Injury? You’ve been injured and you are seeking recovery from the responsible parties. In addition to any pain and suffering that results from the injury, such an occurrence may also impact your job/career. The extent of the impact can range from missing work on a temporary basis due to doctor’s appointments to permanent impaired earning capacity. The law governing personal injury actions has been shaped to account for such losses making these types of damages compensable. In assessing the viability of your potential claim for personal injury, it is important to consider (1) the types of damages you can recover for financial loss, (2) when such damages are recoverable, and (3) how to prove such damages. What are the types of damages recoverable for financial loss stemming from a personal injury? Aside from medical expenses, an injured party is entitled to recover the following: Lost wages and/or “impaired earning capacity” (future lost wages). It should be noted, however, that in order to be recoverable, the lost wages (whether past or future) must be proximately caused by the conduct in question. Civil juries in Illinois are instructed to consider the value of time, earnings, profits, salaries, and benefits lost with respect to awarding past lost wages. Future lost wages, on the other hand, are measured by the present cash value of the time, earnings, profits, salaries, and benefits reasonably certain to be lost. The theory of recovery for lost wages is relatively straightforward in nature. It is simply the amount of wage, commissions, earnings, benefits, etc. lost as a result of the occurrence which gave rise to the suit. This theory of recovery is generally used to compensate the plaintiff for missed work as a result of the incident in question. For instance, a plaintiff who is injured and physically unable to return to work can likely recover under a theory of lost wages. This theory also applies to used sick days, vacation days, paid leave, and unpaid leave in order to receive medical treatment as a result of the incident in question. Plaintiffs can even recover under this theory if they suffer a loss of financial support from a spouse. – When can you recover lost wages? Unlike impaired earning capacity, the plaintiff must either be employed, or it must be proven that it is reasonably certain that he or she would have returned to work, but for the conduct giving rise to the suit. Such was the case in Turner v. Chicago Transit Authority, where the First District found that it was improper for the trial court to admit evidence regarding plaintiff’s salary for a job he did not have at the time of the accident in question. – How do you prove lost wages? The manner in which such damages can be proven varies. Supervisors, coworkers, physicians, job placements experts, and many others may testify as to the Plaintiff’s lost wages. Moreover, the Plaintiff is generally competent to testify as to this claim. Documentary evidence is also admissible to assist in proving a claim for lost wages. The Plaintiff may offer his or her tax returns, diaries, planners, and calendars, which can all be relevant in proving a lost wage claim. A claim for impaired earning capacity, on the other hand, is much broader than a claim for lost wages. It is measured by calculating the difference between the amount plaintiff is capable of earning after his injury and the amount he was capable of earning prior to his injury. – When can you recover as a result of an impaired earning capacity? If the injuries suffered are permanent in nature and prevent future employment, future lost earnings are recoverable. Moreover, in order to recover under a theory of impaired earning capacity, the plaintiff need not be employed at the time of injury. Rather, such damages are recoverable if the plaintiff has an ambition of future employment that is “reasonably certain” to occur. – How do you prove impaired earning capacity? A plaintiff need only present “some evidence” of impaired earning capacity in order to instruct a jury on this theory of recovery. Typically, a claim for impaired earning capacity will be supported by treating physicians or other experts who establish how physical injuries suffered in an accident affect a person’s ability to perform their essential job functions; however, a plaintiff may also testify as to the extent the injuries diminished her capacity to work. The general rule is that the appearance of the plaintiff on the witness stand, the testimony as to the nature of the injuries and the duration of the injuries is sufficient to permit the jury to decide the question of impaired earning capacity. The persuasiveness of such evidence is a matter for the jury, though a witness’s testimony must be more than mere speculation. While expert testimony is not required by law in order to submit the question to a jury, it is at the very least a useful way to avoid an attack on grounds of speculation. For example, in Christou v. Arlington Park-Washington Park Race Tracks Corp., it was inadmissible speculation where the in the plaintiff introduced evidence of what an “average restaurant owner” would earn weekly where he had only an ambition to become a restaurant owner. Injuries can be tragic and life-altering events, which, in many cases, can severely impact one’s job/career trajectory. This can wreak financial havoc upon the victim as well as his or her loved ones. 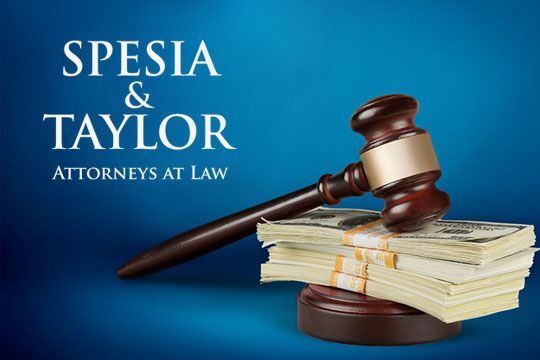 The Spesia & Taylor personal injury litigation team can help assist in minimizing the financial burden caused by injury by obtaining the recovery you are entitled to under the law.